They took my stapler. I knew they would, even though I kept it the first time. Excuse me, ma'am; you're in my chair, I need this chair, and no, I don't think I'm being rude at all because this is my chair and you're sitting in it, and that's what they told me before, too, that it wasn't really my desk and I was just using it and that was why they were putting all those boxes on it, because that's what happened at my last job, my last job in an Office Space, they called it, and you're doing the same thing they were and no, no I'm not being rude at all; next thing you'll be taking away my stapler and I'll never see it again, because that's what happened, they took away my stapler, and when I got it back it was all burnt and it wasn't my stapler anymore. But I am a reasonable person, so I accepted the burnt stapler like a reasonable person, even though I don't care if I look reasonable or not or if they put in jail, either, because I didn't do anything, I only burned the office down and put strychnine in the guacamole and that wasn't anything at all because they already took my stapler. There was fish on the data. I wanted to say, I worked at Initech; I was collating, but I had a chair then, there wasn't someone sitting in my chair and I collated data and when I was by the window I could see the squirrels, and they were married, but then they moved my desk seven times, seven times, they moved my desk, and I told Bill if they moved it one more time, then I'm quitting. I was going to quit. And I told Tom, too, because they moved my desk four times already, and I told Peter, and then they moved my desk away from the window and I couldn't see the squirrels anymore, but I kept my Swingline stapler, because it didn't jam up. Seven times, they moved my desk seven times! And I was told that management was going to fire some people and I said, I said I don't care if they fire me, they can't fire me if I quit! I was going to quit, I said, and the consultants, the Bobs, they were both named Bob, they kept looking at me, and they kept looking at my stapler, and I knew they were going to take away my stapler so I hid it. 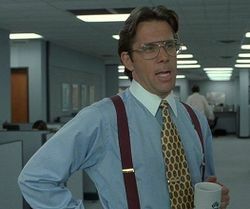 I hid my stapler and said I could set the building on fire. And then they left. And Peter stopped coming into work and there was cake, big layers of cake, but I didn't receive a piece, and I was told to just pass, just pass, Milton, let everyone receive a piece, Milton. And there was lots of cake, people's cake, and I didn't receive a piece, last time I didn't receive a piece, either, because Sue said to let everyone receive a piece. But Peter tore down the posters and unplugged the radio, even though I was told I could listen to the radio at a reasonable volume from nine to eleven... he unplugged my radio. 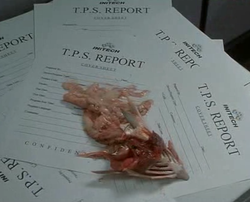 And I found fish on my data, I was supposed to be collating data, but there was a fish on it. And a lot of people were fired, and they were angry. Okay, but I still didn't receive a piece of cake. Or my paycheck. And there was fish on the data. 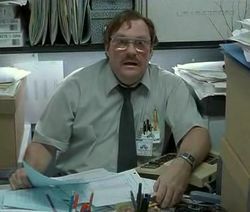 And Mr. Lumburgh took my stapler. So they told me if I was late again, I would be summarily dismissed, but they didn't give me my paycheck, either. And they moved my desk. Seven times, they moved my desk, and they filled it with boxes, and there was no space, no space! Except I still had a chair, and I told Mr. Lumburgh there was no space, and he said, uuh, yeaaaah, and he took my stapler, he took my red Swingline stapler, just had to get that from me, he said, but how did that help the space? And then he moved in more boxes. For those less interested in squirrels, the Bobs at Wikipedia take a more well-rounded approach to Office Space. And they moved my desk again, they moved it into Storage Room B. I told Mr. Lumburgh it was dark, I didn't want to work in Storage Room B, but he moved my desk anyway, because there was a change in plans, there's always a change in plans, like how I didn't receive my paycheck that week, but nobody would tell me anything, so I thought maybe, maybe I could set the building on fire. I could set the building on fire. And there were cockroaches. I could set the cockroaches on fire too. I worked for Mr. Lumburgh at Initech, but Peter told me he had four bosses, but he also told me he really didn't have time to talk about it. But I still hadn't received my paycheck, and money was disappearing from payroll and people were getting panicked, but I still hadn't received my paycheck even though I still had a chair and you're still sitting in my chair. But it was dark and there were rats, I could hear them, and they weren't married; they weren't like the squirrels at all. They were dark and dirty and they played with the cockroaches. Then they told me I would have to move again and they brought more boxes and they took away my chair and that... that was the last straw. I was going to set the building on fire. But first I was going to get my stapler, so I went to payroll and they told me to go to reception, but they told me to go to payroll, so I went in anyway and I had to get my stapler, I just had to get that back from him. I went to get my stapler, my red Swingline stapler, and there was something on the floor. Like the rats, except it was an envelope, and unlike the rats and the squirrels, it wasn't married to anything, so I took it, and it didn't bite me or try to marry me, and it was my paycheck, so I took it and left and I quit. Then they told me I would be summarily dismissed again, but I summarily dismissed them, because I quit. I quit. So I set the building on fire. So Ma'am, excuse me, ma'am... you're still in my chair, even though you keep scooting away you're still in it, and I thought I should tell you what happened so I told you what happened, now I really need my chair, because I'm a reasonable person. And we don't want another incident, especially not with squirrels, even though there aren't any squirrels here, there could be squirrels here just like they could put salt on the margarita, even though I said no salt. No salt, I said, but there was salt on the glass. Big grains of salt! I'm a reasonable person, though. And I have my stapler now. Except it's kind of burnt. 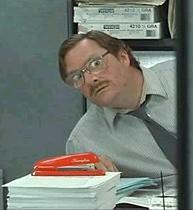 My stapler is kind of burnt and you're still in my chair.